Before I head out to Maryvale today to catch some combo major league and A’s minor league action, I wanted to post a table showing the approximate walking distances from various rail transit stations to ballpark entrances. In most cases these are door-to-door, measured with Google Earth’s ruler (path) tool. I’ve only included ballparks which have adjacent or nearby (within 1 mile) subway, light rail, or commuter rail stations. Bus stops do not count. The one exception I’ve included is Dodger Stadium just to illustrate the distance. I measured the Howard Terminal distance using the approximate location of the ballpark in the Manica Architecture drawings. An infill BART station built at Market/Brush Streets between 4th and 5th would be around 1/4 mile away from Howard Terminal. In case you’re curious, the distance from Lew Wolff’s Coliseum North ballpark concept to the Coliseum BART station would’ve been around 2/3 mile. Fremont Pacific Commons would’ve been 1.5-2 miles from the Warm Springs BART station depending on infrastructure. A ballpark at Warm Springs is unknown because there was no specific location unveiled. The San Jose Diridon ballpark site sits 500 feet from the Diridon Caltrain station and 800 feet from the San Fernando light rail station. The under-construction Berryessa BART station is nearly 4 miles away from Diridon. Let’s be clear about one thing can be agreed on when it comes to Levi’s Stadium: it will be much easier to get in and out of there than the painfully difficult Candlestick Park. Beyond the obvious technological improvements and swankier facilities, Levi’s Stadium has much better built-in infrastructure than the ‘Stick. There is light rail service directly in front of the stadium, with links to Caltrain in Mountain View and San Jose. There’s also a Capitol Corridor and ACE stop even closer, which will bring in fans from the East Bay and Central Valley. Highways 237 and 101, which define the Golden Triangle region of Silicon Valley, feed the area surrounding the stadium, which is where the majority of the parking spaces will be found. VTA, Santa Clara County’s transit authority, announced a plan to bring fans to Levi’s Stadium from various parts of the Bay Area. Existing partnerships with other transit agencies will have to be leveraged, whether it means transfers to light rail from Caltrain or to express buses from Fremont (by 2017, BART-to-light rail in Milpitas). Still more options will be available from some of those other agencies running their own buses straight to the stadium, along with private bus operators providing a more upscale trip from San Francisco and the North Bay. The transit debacle at the Super Bowl highlighted the difficulty associated with trying to forecast transit ridership for special events. The New York/New Jersey and San Francisco/Santa Clara dynamics are similar. For the Super Bowl, most of the hotel rooms and peripheral events will be in San Francisco. That makes it doubly important that the link between SF and SC are solid. New Jersey transit severely underestimated the number of fans that would take the commuter train option from Penn Station to the Meadowlands through Secaucus, which led to hours-long delays for many frustrated fans. Since the NFL and local officials were encouraging transit use instead of driving or busing, designated public parking lots near MetLife Stadium were relatively empty, including certain bus lots. Meanwhile, buses that were scheduled to pick up fans from various hotels in Manhattan were underutilized. When I took NJ Transit to a mere Jets preseason game at MetLife Stadium in August, the trains were quite packed and total ride took 45 minutes despite going less than 9 miles, was an ordeal. The biggest problem was the required transfer at Secaucus Junction. Because the train to the Meadowlands complex is a separate rail spur, all NJ trains forced the Secaucus transfer. Then fans had to go inside the station, change levels, and move to different platform where the Meadowlands train could be boarded. Secaucus Junction works fine for daily commute levels of ridership, but it is terrible for a big event such as the Super Bowl. If there is a next time, NJ Transit has to figure out a way to allow trains to go directly from Manhattan to the Meadowlands. While Secaucus can’t handle the crush, Penn Station can (though not without discomfort). Like the NY-NJ transfer issue at Secaucus, there is a huge potential bottleneck at the Mountain View Caltrain station, where most fans coming from SF and the Peninsula will transfer. Trains from the Peninsula will stop along the station’s southern platform, which will mean that fans will have to cross at least 3 sets of tracks (2 Caltrain, 1 VTA) in order to make the switch. While the southbound platform has a decent-sized queuing area, the northbound platform, where fans would wait for train going home, is notoriously small and narrow. Each Caltrain train set (5 cars + engine) is designed to hold up to 1,000 riders. Compare that to a 3-car light rail train, which holds about 500 riders including standees. That means that two light rail trains would have to pick up a single full Caltrain’s worth of riders. There’s also a bottleneck just east of the station, where trains run on a single track to cross Central Expressway. VTA plans to construct a second track and pocket track for train storage, which should get rid of the bottleneck. That project is expected to be completed in two phases, the whole thing done by 2016. Even with those changes, it’s hard to say just how many people will take Caltrain to Mountain View and then transfer to light rail. 6-8 Caltrain trains worth? That’s about 10% of the total crowd. There could also be single trains from Capitol Corridor and ACE covering another 2-3000 fans. 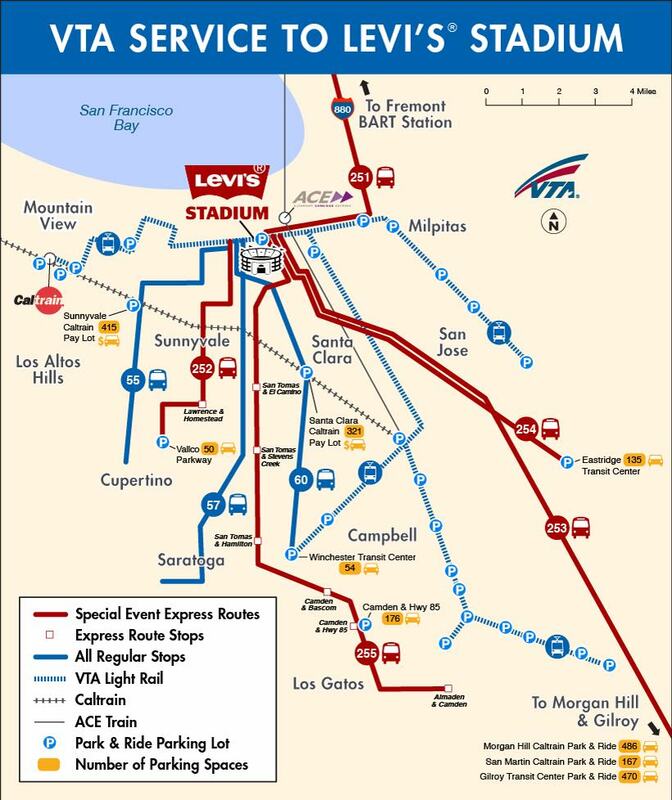 Since the single-tracking bottleneck will take a couple years to resolve, there’s a good chance that fans going to Levi’s Stadium will instead use one of many express buses parked at the Mountain View station to get to the game. The route would be more direct, and much of it would be on a freeway or expressway. I suspect that buses may be an even more popular mode of transport than they were at the ‘Stick. Rides from the North Bay will be especially long, requiring serious lead time. It’s not hard to see a fairly new institution already in place being used extensively for 49er games: the private Silicon Valley tech bus. Sure, there are already private coaches that take fans to games, especially groups that can charter. In this case I wouldn’t be surprised to see the same buses that shuttle workers to Google and Apple used on Sundays to take fans directly to Santa Clara from North Beach or Marin. Tickets are already much more expensive and cater to a move affluent crowd than before, why not provide luxury transit? The controversial private busing highlights a problem that has been generally ignored by the national media who have attempted to cover the issue: the disjointed Bay Area transit system. Caltrain runs through the downtowns of numerous cities on the Peninsula, which is mostly good and convenient. But if Caltrain or BART ran down 101 to near Google or 280 to Apple, there would be less of a need for such solutions. Levi’s Stadium, which is across the river from Cisco and a mile away from Intel’s headquarters, is in a similar situation: one or more transfers, inelegant design, faster alternatives. For the Super Bowl, these buses will be in even greater demand, especially as certain operators are contracted directly by the NFL for official use (teams, personnel, media). Fortunately, the vast majority of games will be at 1 PM on a Sunday afternoon, not during commute hours. For the first season there will be no Thursday or Monday night games, with a Cal Friday home game snuck in as an exception. The 49ers’ 2014 promises to be a year of settling in, on the field for the team and in the stands by the fans. Getting there will literally be a process of trial and error for all involved. The Merc’s Mike Rosenberg reported today that BART station we all know and love (and some outsiders fear) servicing the Oakland Coliseum will be renamed. Named Coliseum/Oakland Airport Station since 1977, @SFBART A’s, Raiders and airport stop will be renamed just Coliseum Station. Why? It has to do with the Oakland Airport Connector, the 3.2-mile, $484 million people mover which is scheduled to open in fall 2014. You’ve probably seen construction of the OAC’s metal guideway along Hegenberger, or the terminal just across the street from the BART platform. In order to avoid confusion among air travelers, the BART station will simply be named “Coliseum” while the OAC station at the Airport end will be named “Airport“. BART Train operators have long had the practice of announcing the transfer method to the airport when approaching the stop. Expect that practice to continue with a longer explanation (no, the airport didn’t disappear!). On the other hand, the OAC will not have train operators at all. It uses automated people mover technology, similar to SFO’s AirTrain or driverless shuttles at other airports (Denver, Atlanta, Tampa, New York JFK). The technology comes from Austrian firm Dopplmayr. In Australia I rode the Katoomba Scenic Railway, a cable car funicular that’s one of the steepest in the world. It’s also a Dopplmayr installation. Like the recently opened Airtrain JFK, the OAC (a brand has not been announced yet) will require a fee, just like its AirBART bus predecessor. BART estimates that the fare could be up to $6 each way, twice as much as the old bus. By comparison, AirTrain JFK costs $5 and runs a longer route, 8 miles to the Jamaica transit hub in Queens. OAC was highly controversial at its inception because of its high cost and limited usage, but the argument that it was better to have a more efficient route not tied to surface traffic won out. Hopefully the fares will be able to cover operating costs. Besides the Coliseum and Airport terminals, a third station is under construction at Doolittle. A fourth station at Hegenberger and Coliseum Way was considered at one point, but was slashed due to cost. Given the high fare that’s probably a smart move, though it’s also something of a lost opportunity should Coliseum City come to fruition. There’s a lot of news during this holiday week. I figured it would be best to drop it all in here. First up, A’s news. I was proud to be John Keker’s law partner for 10 years. One of the best legal minds in the biz. The battle vs. Joe Cotchett will be epic. Keker also has his hands full defending Standard & Poor’s in the federal government’s lawsuit over allegedly fraudulent practices. Let the games begin, I say. Members of the ILWU (Longeshoremen’s Union) are opposing the SSA settlement, which would close Howard Terminal and potentially convert it to a ballpark site. The union’s complaint is that the net effect of the settlement and consolidation is the loss of union jobs. This contention has evidently forced the Port of Oakland to again delay voting on the settlement to July 11. BART’s still on strike. Last night’s announced attendance was 17,273, the smallest crowd since the end of May. Tonight’s a fireworks game with the 4th tomorrow, so crowds should be hefty despite the lack of BART. The City of Glendale, Arizona, approved a 15-year lease deal to further subsidize the Coyotes NHL club, keeping them in town until at least 2018. The team has an out clause after only five years if they demonstrate they’ve lost $50 million over those first five years. In return, the team will be renamed the Arizona Coyotes. While the NHL continues to own the team in the interim until a purchase is finalized by Renaissance Sports & Entertainment, a new arena operator has been found in titan Global Spectrum. Folks in Seattle were following the happenings in Glendale closely and were ready to pounce if no agreement could be made. Now the Emerald City and Chris Hansen are officially 0-for-2 in attempts to lure franchises to Puget Sound. The City of Anaheim and the Angels are jointly funding a study to determine the cost to keep Angel Stadium up-to-date. Initial estimates have the cost to renovate Angel Stadium at $120-150 million. After the Dodgers spent $100 million to renovate clubhouses and scoreboards, I’d be surprised if the Angel Stadium tab was only $150 million. As the cost to build a AAA ballpark in El Paso rises, the new owners of the franchise backed away from giving $12 million in personal guarantees towards the project. Curbed has a neat pictorial retrospective on the various ballparks that have called New York home over the decades. And a quick announcement: I plan to be in New York for a few days around August 24-25 Labor Day weekend. I’m still locking down the plans. The Yankees are in town that weekend and the Mets prior to that. I’m working to take in games at both ballparks, and some US Open tennis action if I can fit it in. If you’re there at that time, drop me a line (email, Twitter) and we can have a chat and/or take in a game. The middle game of a three-night set at Dodger Stadium had thousands of discounted tickets available on StubHub, a reminder that even for teams with $200 million payrolls and season attendance totals surpassing 3 million almost regularly, it’s still possible to find a deal. Or in Tuesday night’s case, an empty house. I came because I happened to be in town for a week and I wanted to catch a game at either Chavez Ravine or Anaheim. I also wanted to take the Dodger Stadium Express, the bus that runs directly from Union Station to Dodger Stadium. This year there was also the added benefit of a bus-only lane going up Elysian Park Drive to help speed up the trip. I calculated that it took 15 minutes to get from Union Station to the intersection of Sunset and Elysian Park, then less than 5 minutes to get to the final destination behind centerfield. As you can see from the picture below, the buses get packed. It’s a good option for those who want to take Metro or a Metrolink train in. The $1.50 fare is waived if you show a ticket on the way in. The driver doesn’t bother to check for anything on the way back. The Tuesday night game had no giveaway and was billed as Taiwan night. Pre-game festivities included a traditional band from Taiwan who played a mournful version of The Star Spangled Banner. Since this is Hollywood, there was also a purely commercial wrinkle as the American band Fall Out Boy was on hand to promote their new record. Pete Wentz threw the ceremonial first pitch. I entered the stadium greeted by this view. There isn’t much else to say about the experience, other than that the scoreboards by ANC Sports are quite impressive. Circulation between the levels is still impossible, and since I got the $11 ticket near the RF foul pole, I couldn’t go any higher than the club concourse. The final crowd (announced 35,898) was not much better than what you see above. I assume that the events surrounding the Boston Marathon incident may have scared some people off. The Padres dropped a 4-spot on the Dodgers in the first inning off Chris Capuano, so the small crowd that showed up wasn’t tempted to stick around for long. Security didn’t seem heightened to a great degree. The best way to describe the new scoreboards is to think of them as a set of three. The lower part along the outfield fence is an out-of-town board and a State Farm ad. When a Dodger comes up to bat it usually changes to an animated intro. This is mirrored on the small display underneath the diamond/hexagon large display. The strip is a great addition because it’s the perfect spot for a perpetual in-game line score. Unfortunately, the geniuses at Dodger Stadium don’t keep it perpetual at all, instead choosing to include the strip as part of the ongoing multimedia presentation. The big board is very impressive. Even the funky shape works to the team’s advantage, as there are little nooks for the clock, the on-base situation, even logos for the teams above the lineups. When a Dodger comes up to hit, the LF board shows a big picture (in keeping with the old setup) and on the bottom corner is the player’s Twitter handle. Statistical presentation is clean and modern, though it could use more advanced stats. I was eventually able to sneak down to the field club seat area down the lines. By the 8th inning everyone wanted to go home. An attempt to sing Sweet Caroline in honor of Boston was met with a big SoCal “meh”. WiFi was supposed to be better, but I couldn’t tell. Who knows what would’ve happened if the game were better? We’ll never know. Maybe the next time I go to Dodger Stadium, someone will give a damn.